1. Decorate your steps or patio with Graf’s handmade live greens porch pots that’ll stay green all winter long. Change the Christmas embellishments to a more wintery look after the holidays. Put a custom wreath on your front door to add intrigue and beauty to all who drive by and visit. 2. Give your favorite gardener (and yourself) a ‘Jacob’ Hellebores that’ll bloom through January! In March/April, you can plant the hellebores outside in your shade garden where it will be a deer-resistant groundcover through fall. ‘Jacob’ will then bloom again for you next winter- only this time it will be in your garden. How awesome it that?! 3. Visit with Santa! We offer Free Photos with Santa three Saturdays and Sundays during the holiday season (11/29-11/30, 12/6-12/7, 12/13-12/14) from 11AM-3PM. Bring your entire family, including pets, for the photos. Kids can make a free ornament to take home too. In lieu of payment, donations are accepted to benefit the Salvation Army’s Red Kettle Campaign. 4. Use firewood to create a warm fire during your holiday parties or while relaxing at home. The crackling sound of wood and laughter are the perfect soundtrack for your holiday memories. 5. Create a miniature garden for your table setting or to give as a holiday gift. 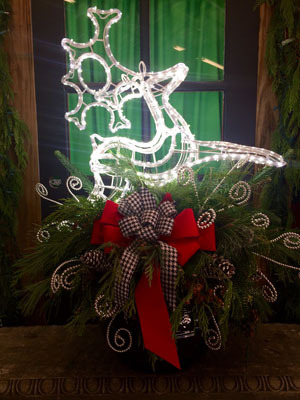 Make one at our Fairy Garden Workshop on Tuesday, Dec. 2 at 5:30pm with loved ones, kids and friends. Not available then? Stop in to pick up miniature poinsettias, holiday accessories, fairies and more whenever you’re ready to plant! 6. Start a Paperwhite bulb kit for your home and office or to give as a gift. Once the bulbs are watered (and stay watered), beautiful white blooms appear in about 6 weeks. Drop by to see the Paperwhite Kits we offer or pick up bulbs to make your own! 7. Give the gift of gardening with handmade holiday arrangements and poinsettias that are perfect for teachers, caregivers, friends, coworkers and more. 8. Put up a bird feeder and fill it with seed to add another element of interest to your winter garden. 9. Enjoy precious time with family and friends. Make memories like baking a pie with your granddaughter or going as a family to a holiday concert. The little things matter too- a holiday card to say hello or a poinsettia to say thank you. 10. Bundle and drive around to see festive holiday light displays at local parks, attractions and in area neighborhoods. 11.5.14 – What is on your Desk? I always find it interesting to see what others keep in their office or cubicle. Often you see pictures of loved ones, perhaps an inspirational quote or small decoration. Did you know a small plant on your desk or someplace in the office will increase concentration, spark creativity and clean the air. In fact, recent studies show that plants in the office also help to reduce stress and increases productivity over offices without plants. Even one small plant can make a big difference and with minimal care will remain beautiful for a long time. Whether you work in a traditional office setting, a school or perhaps from home here are a few tips for selecting a plant that is right for your office. One important factor to consider when choosing a plant for your office is whether you have mostly artificial light or bright natural light. Plants will grow in either environment however some varieties do better in bright light and others do better in low light. You might consider a blooming houseplant like a cyclamen that will bloom for several months or a small terrarium with an assortment of plants. If it is a school setting you might consider something that is educational like a carnivorous pitcher plant which eats insects or a spider plant that grows baby spider plants. An amaryllis will provide a growing experience as you watch it develop and then bloom in the winter. Succulents are wonderful if you have bright light because they require watering less often than others and they look good planted together in a small bowl or individually in a decorative pot. Other easy to grow houseplants include philodendron, snake plants, & ferns. Enjoy a single plant or group several plants together in a pleasing combination. Most houseplants will thrive with watering them thoroughly 1 time per week and turning them ¼ turn weekly so they get light on all sides. Be sure to use a saucer to catch the water and drain the saucer ½ hour after watering. You may want to personalize your plant with a decorative container. Now is a great time to brighten up your workspace and enjoy the many benefits of indoor plants. Stop in and we’ll help you make selections.